As discussed elsewhere, to get a long lasting finish on your paintwork, you really need to use a Dual Action (DA) polisher. DA’s are unique in the world of polishers in that they are designed to be as powerful as possible, and yet safe to the paintwork. Unlike other types of polisher, you don’t need to worry about burning through the paint. This would ultimately require a respray. As the name suggests, they are dual action. This means that the pad spins on the axis spindle (like a CD in a CD player). However, along with this it also moves in an in and out fashion so that it is effectively having two different types of oscillation. There are two large benefits to this. The first is that since the pad is constantly moving, it helps to limit heat build-up on the panel. This therefore limits the chance of the paint being damaged. Likewise, because the pad is spinning in two different axes, it means that you can carry out the task much quicker. This dual action method allows the user to safely remove a very small amount of clear coat from their paint. By doing so, it removes the scratches and swirls that are present. This is generally due to the fact that the swirls are superficial. If it was the scenario that the scratch was extremely deep and down to the base metal, then this would require the panel to be painted.The prices of these DA’s can vary wildly depending on the feature set. Below you can read our best picks. Meguiar’s are synonymous with high quality car detailing products. It is a third generation business and under the leadership of Barry Meguiar, it has made car detailing as common a hobby as playing football. Meguiar’s were very observant of the fact that detailers wanted an easy to use and yet powerful system to polish their cars and remove swirls and scratches. In the case of the MT300 (320 in the UK), you’re getting a lot of bang for your buck. It has a variable speed controller on it. This is actually an extremely important feature for any DA. By having this speed controller, it allows you to properly remove any paint defects by using the correct speed. If the paint is particularly bad, you have the option to increase the speed. The maximum speed of the MT300 is 7500 Orbits per minute. With regards to the ‘throw’ of this machine, it is 8mm. The overall build of the DA is excellent. It’s a lightweight polisher, but extremely robust. It has been designed to ensure that you can use it comfortably for long periods of time without hurting or straining your arms and wrists. You are also able to use this as a multifunction tool. By that we mean that it has support for three different sized backing plates. The smallest backing plate it accepts is 3″ and 6″ is the largest. This will allow you to polish tighter areas such as door pillars and bumpers as well as large areas such as the roof with the same polisher. It is highly recommended and is well worth the price. This is a rather curious addition to the list, and is different to every other entrant. For those that have a tighter budget, Meguiar’s have come up with a revolutionary DA polishing solution. The G3500 connects directly to your power drill. Due to the power delivered from cordless drills, it is recommended that a corded one is used, with a maximum speed of 2,500 RPM. The system is extremely easy to use and set up. The backing plate has a drill bit attached to it. 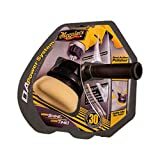 This securely locks into the chuck on your drill and allows you to not only polish your paint, but apply wax to it as well. 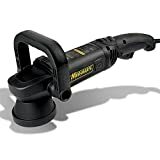 It has a built in handle which attaches to the backing plate to allow you to have full control over the polisher and ensure that you get the perfect finish every time. You can of course use it with a selection of pads for your needs and makes your paint correction extremely easy. If you already have a drill and you want a polisher, this is a great option for you. Great for compounding, polishing & waxing. Rupes are well known amongst the detailing elite for their exceptional style and build quality. Every unit is hand built in Italy and it truly is a an excellent piece of Italian engineering. The LHR15 is the DA for those that really take their detailing seriously. It is also the recommended polisher for those doing the job for a living. The power that the BigFoot deliver is second to none. It has been improved upon in every way over the previous model, from weight to the ergonomics of the unit. It is also 30% more efficient. Of course, the benefit of this is that it means that you can correct the same amount of paint in an even quicker time. By default, it is provided with a 5 inch backing plate. However, this can be changed out with a larger or smaller one should you need this. 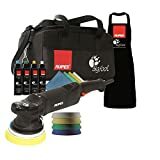 The Rupes Bigfoot (LHR15ES/DLX) random orbital polisher was designed with the detailing market in mind.